Throughout history the red flag has been used as a warning. In the Middle ages it signified a fight to the death, while in the 18th Century here and in Europe, it signified revolt (particularly effective when soaked in blood). Today the National Weather service employs the red-flag warning as an alert to the hot, dry and windy conditions that can start and fan a conflagration. Colloquially, of course, it’s a metaphor for caution. Who among us in the art community has not been confronted with the metaphorical red flag? I can’t speak for dealers and curators, but as an artist I have seen an abundance of them: the dealer who “forgets” to tell me a work has been sold, who prints or posts images with incorrect information; who damages work and then shrugs it off with an, “I know you can fix it”—even when I can’t. Contrast that irresponsibility with the dealer who says, “You've already waited too long for payment. I'll write you a check now for the full amount and secure payment at my end from the collector.” Or the dealer who recently emailed to say, “Just want to let you know that the gallery is closing in this location. I’ll have more information later but right now my priority is returning all the work to the artists.” These are the dealers you hold dear. My friend Jhina Alvarado, a San Francisco painter, has seen an abundance of red flags lately. In When It's Time to Jump Ship, a recent post on her Rising Artist blog, she talked about the flags waving so madly that she finally had to leave the gallery: the bounced check, the cancelled opening, the 30% discount (!) and more. There are other red flags. Have you seen any of these?
. Who turns down any and all requests with, “It’s gallery policy.” What policy?
. Inquire discretely of one or two of the gallery artists what their experience has been. Promise confidentiality. And then stick to that promise. Are you hearing about late payments or checks in the mail that never arrive? Red flag. Are you hearing of this situation from many or most of the gallery's artists? Run! Now, over to you: Tell us about the red flags in your experience. And what you’ve done about them. Thanks so much for this topic! I am currently in a bad situation with a gallerist and am working out how to remove myself from the situation. Now I see that I was so flattered when she initially showed interest in my work that I probably ignored some of the red flags. The latest issue I've had with her is that she designed a horrendous postcard for an upcoming group show. I basically walked her through creating a much more presentable design, and told her at least twice to be sure to use the high res file I'd sent her and not the original small one that I'd sent in a group so that she could chose an image. Guess which one she put on the postcard? When I expressed my frustration with this, she told me not to worry so much and that postcards are "not so important." Whenever her incompetence leads to problems at the gallery, she blames one or all of her artists. I've never once heard her take responsibility for her screw ups. She occasionally sells one of my paintings, but not enough to justify the amount of stress she creates in my life! This post really touches on my experience with a gallery I've worked with for years. Part of me is actually hoping that in my current show nothing sells so that pulling out will be easier. Many of the red flags that you list are here: damaged work, not returning phone calls, making me feel like a pest when I ask how the show is going, and more. Since I am outside the US and the gallery uses dollar rates, a unique red flag has been a quirky unofficial exchange rate that always works in the gallery's favor. It's sad that for lack of alternatives I have stuck to this so long. Another red flag: when raising criticism, being met with a guilt trip about loyalty, how hard she has worked, etc. And how about being expected to give selected works to the gallery as gifts or to sell them to the gallery at a huge discount? I was uncertain about a gallery that contacted me about representation. I'd heard some things, 3rd party. To confirm one way or the other, I ran a credit check through Dun and Bradstreet. For under $100 a learned a lot about that gallery, especially their payment history, ownership, number of employees, etc. It confirmed to me the gossip I'd heard about late payments, or non payments, and so I stayed away. Yes, it cost me a few bucks, but saved me a considerable amount of grief. Re Amber's comment: Running a credit check is being proactive and professional. Kudos to you, Amber! And should you share that information with others, it could never be considered libelous, because you have the facts on your side. How about the gallerist who is rising so quickly, it's a bit suspicious? I showed with a gallery in the E. Village in the late 80s. When he made the move to Soho, the new space was incredibly grand. He went from about 40mph to 100 on a dime. I was never carried over though.... he didn't keep me. I remember picking up my work and feeling like sh*t.
A few years later - maybe it wasn't even years, not sure - I heard he closed overnight and never paid the artists, never returned their work, nothing. Just gone. I was glad then that I didn't stay with him. After all, my work was all I really had. I think the red flag here was him biting way more than he could chew. Yet who could know that ahead of time...? I had a terrible situation develop with a gallery that represented me in 2004. We had done a show 3 years earlier that went fairly well. This time the owner greatly overextended her gallery's resources and then did nothing to advertise my show or promote it in any way. Up till then she was awesome, came to the studio a few times and helped me set prices. We discussed the publicity campaign she would run for my show. The only work that sold in the show were sold because she had great windows and people driving past stopped to come in and purchase pieces. I had to hang the show entirely on my own as no one was "available" to help me at all. She even misspelled my name on the wall sign. She didn't pay me when the show ended and continued to stonewall me for weeks. I removed my work from her gallery. Then I decided to take matters into my own hands and attended every exhibition opening she had for the next few months. I would go in and find the artist immediately and begin to chat with them. Not about my own situation with the owner but about their work and processes. She would, within minutes, come over to see what was going on. Each time I smiled brightly at her and said, "Oh HI! I'm just here to pick up my check from the show." We'd break off and go to her office where she would write me a check for a portion of the amount she owed me. It took 5 months, but I got every penny she owed me. I was lucky, she closed her gallery shortly after I got my $$$ and some artists lost thousands of dollars and many lost their work as well. This was a big hurt to the community and there are so many excellent galleries out there that don't deserve the skepticism with which we sometimes view them. 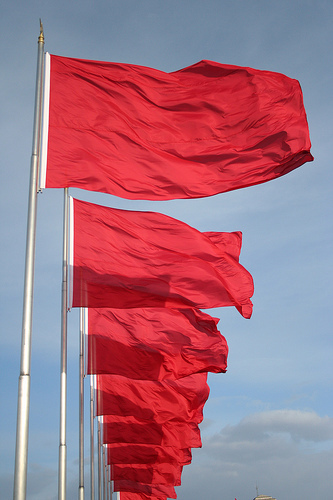 Your suggestions on red flags to watch for are excellent and will be a great help to artists and galleries. Thanks! I am wondering if we can make a list of the dealers one should stay away from and post it? I know a few dealers that made my life stressful until I walked away. I have a friend in a terrible situation of non-payment with a gallery that people respect. It turns out they seem to never pay their artists! I think that most of us even when we hear stories think, well it won't happen to me if I work with them.But of course it does. Working with art dealers is probably an absolute necessity for an artist to gain any kind of audience for their work. Having been at this painting and showing business for many years, I've had just about every bad thing happen that could (non-payment, very late payment, damaged work, inept publcity for shows or no attempt at PR at all, unreturned emails and phone messages, and sometimes just an unnessary insensitivity or even rudeness from the dealer).Often the "big gallery dealers" majored in college in Arrongance. I think most often artists suffer the slights and blows in silence, not wanting to tarnish what hard won momentum their career is trying to achieve. Usually the bad behavior is mixed in with a few things the dealer does well. I've rarely had dealers who were bad at everything simultaneously, though a few have come close. Sometimes they can be great to work with too. It does happen. On the balance, I still believe it is worth it to work with dealers and their galleries. They are in a position to help your work find an audience on a level you just can't do for yourself (though you can do a lot to get viewers and collectors too). One just has to weigh each situation carefully to see if a particular gallery is a place you want your work to be. Sometimes you have to end relationships, but only do it after you've "slept on it" and are sure you clearly understand the pros and cons. Too many artists I fear get their feelings hurt early in there first brush with galleries and retreat from the fray too early. Remember dealers aren't there to be your friends or to emotionally support you. They may, but that's an unexpected bonus. It can be hard when you are out of town and out of the loop, you might not see it coming. I was excited to be invited to be in my first NY gallery group show. My piece sold right away. I was told the client was "making payments", and got the first third of the money in teeny tiny checks spaced out over a year. The gallery closed, the client emailed me to say how much he loves the piece, and I got shafted for the remaining $2,000. The gallerist strung me along for awhile, saying the $$ was coming, saying she loved my work and was to reopen somewhere soon. Three years later, she is "out of the art business". I really think there needs to be a professional board for artists to take their complaints to. SO many get abused because they fear being labeled as "difficult" in exchange for wanting decent treatment. @Anonymous 11:30--Working with a gallery at a distance from where you live is difficult, even nationally, so your international location will make things a bit more difficult for you. Is there someone here who can advocate for you? @Eva: Fast growth may be suspect, but if a gallery gets a backer, bigger things are possible. Congrats, though, on your "bad luck" turning into good luck after all. @Chris: How smart of you to remain visible and, frankly, a bit threatening to the dealer. Your presence surely made her think you were sharing info with the new artists. Good for you! You were resourceful and got paid. What might you do differently before entering into a relationship with a new dealer? @Susan: Amber George's Dun& Bradstreet research was a great idea. I also talk with artists--at openings, in casual conversation--to ask how things are with their dealer, if they have heard of difficult situations. If we all do that occasionally, we'll broaden our network. There's also www.howsmydealing.blogspot.com, which focuses on New York galleries. It's all anonymous, so the possibility exists for abuse, but I know the person who manages it and I know him to be a decent, pro-artist person without being anti-dealer. @Anonymous 3:22--I totally agree that it's worth the effort to work with dealers and their galleries. And I think that the bad ones are in the small minority, but when you are dealing with such a dealer, the problem looms large. @Anonymous 3:51--There's no reason to get shafted. Be proactive. Talk to a VLA lawyer. Find about small claims court. Just make sure your paperwork--contract, or invoice, or consignment sheet--is in order. You may able to get a lien on their property, or sue for the amount due you. Even better if you can get the collector to corrobortate that s/he paid the dealer. Go after that $2000! It is not being "difficult" to expect and receive payment in a timely manner, or to receive your work in the same condition in which you dropped it off, or to have your phone calls or emails returned in a courtesous and timely way. Thank you. Joanne, for bringing this up. I had terrible experiences with 2 well-known galleries in New York. It took years to get paid. I mentioned this problem to several critics recently on their visits to my studio, because this problem is never brought up in international art magazines they write for. All of them seemed uncomfortable with this subject, one of them told me that the magazines would NEVER write about this because they would lose advertising dollars. That makes sense of course, but still the artists suffer and there are so many of us in this situation, almost every artist I talked to had an experience with this. Galleries can get away with this because their fraudulent actions are shoved under the rug. This should be stopped! I think artists should find creative ways to show their work and it should not be negatively looked upon if they do, it would be much better for their collectors as well. Yes, it's true that magazines are unlikely to broach the issue of deadbeat galleries because publishers don't want to offend advertisers or potential advertisers. But most bloggers are under no such constraints, which is what makes us powerful. We can address the issue. If you feel you want to name names, remember that it's never libelous if you speak your truth. If Gallery Y has owed you money for over a year and keeps offering excuses why it hasn't yet sent you a check, you are well within your legal rights to declare: "Gallery Y has owed me x-amount since last year, and each time I try to get paid, I am told that "The check is in the mail," but I have yet to see a check. Shame goes a long way to getting you what you need. Don't be afraid to speak your truth. Since it hasn't been mentioned yet, another red flag is the gallery that "doesn't like to use contracts," as reported by your friend Jhina. I've been lucky about not having any serious problems to date, but I had a recent mishap in which the gallery and I had different records about how many of my paintings were in their inventory. Consequently a few of them were unaccounted for, for three months or so, until they turned up in a spring cleaning. The whole thing could have been avoided if we had current consignment sheets, so I take responsibility, and I plan to dot every last "i" from here on out. Man, I'm afraid we're barely scratching the surface of bad practice/red flags at galleries! Top of my list though would have to be the "Build it and they will come" type galleries, who basically have no idea what they are doing, other than hanging work up in a "good" location and praying for the best. Ive had so many friends disheartened by the fact that a new gallery can literally be right next door to an established one and get no press, no sales, no nothing. If galleries research us, then we need to be better at researching them, if u have never heard of them before, do your serious due diligence to see if they actually sell work, because many artists are so reluctant to bad mouth a gallery and actually admit" "yeah, I got a beautiful show there, but it cost me $5K to frame and ship and they sold nothing! Due diligence, indeed. Amber's suggestion of Dun & Bradstret research applies here, as does seeking out an anecdotal history of the gallery, as well as informal word of mouth (typically the kind of info you hear in conversation at openings or other places where artists gather). I've often said in teaching, and probably here in these MM posts, that in the hierarchy of galleries, it may be better to aligh yourself with a serious, long-time co-op gallery than a new and inexperienced commercial gallery. Thanks for mentioning "the gallery doesn't like to use contracts." This is why I always create a visual consignment sheet--two copies, each with images of the work as well as the written identification and price--which I sign and request that the dealer also sign, returning one copy to me. Not everyone has the staff, or the organization to maintain that kind of recordkeeping, but I do because it's my work on the line. Joanne- You brought this discussion around to the importance of artists behaving in a business-like manner. Of course, that doesn't eliminate unscrupulous dealers, but it is important to create a paper trail. I also bring 2 copies of a detailed consignment slip when delivering work. If I have to chase money I keep a log of phone calls--date, who I spoke with, what I was told. Many years ago I used that record of calls to convince a cheat who claimed she had returned the work to pay up for a piece she had either lost or sold. Another time I took the first steps of filing in small claims court--the dealer started paying off the balance as soon as he saw I was serious. @Chris: I used the same approach of showing up at openings with another deadbeat dealer many years ago. They are so freaked that you will scare off other artists (and make them look bad in front of clients) that they pay just to make us go away. Two weeks into a first solo with a gallery the silent partner/spouse called me to say they thought it would be a great idea to offer the paintings two for one. (7x8 foot paintings, and the show had just been reviewed.) They said they would eat the cost, but they really wanted to sell the work and place it in a collection. I told them it was a horrible idea, called the dealer the next day and all but asked if they were high. Great post and very interesting comments. I agree with what some people have said: it can be tempting to take any offer given to you for representation without thinking too far into the future. I think most galleries take 50% or around that from sales. Can they double sales numbers for you? Also, are they earning that 50%? If they're not doing publicity as some people have mentioned, what exactly are you paying them for! When you say that the dealer was willing to "eat the cost" does that mean they would sell two paintings for the price of one but give you the 50% due you for the second painting? I'm not a fan of selling cheap, but depending on the dealer, I would have asked "What collector" or "What collection." If a dealer is thinking strategically, without asking you to "eat the cost," perhaps there was a method to the madness. I urge you to read Ed Winklemnan's post on "The Logic Behind the 5/50Split" (http://www.edwardwinkleman.com/2007/06/logic-behind-5050-split.html) as well as my own post, "The Dealer's Commission: 50/Fifty," live linked on the sidebar here from 4.26.2010. So interesting Joanne to read your list of what a good gallery should do. I have been in several what I would call good galleries but never have found one to live up to that standard. I was mostly just happy that they sold the work and paid me on time. Even so called good galleries have closed under me leaving me to try to retrieve my work from the bailiff who put locks on the gallery door. Some galleries have been sold and in spite of show commitments, the new owners have cancelled shows out from under the artists even at the last minute. Even "good" galleries have decided that they will "pay" the artists at the end of the month following the month of the sale. So when an artist sold a piece at the beginning of March, we did not receive our money from the sale until some time in May. The gallery had use of the artist's money in their operating account for a full 45-60 days without interest. Nice. When I pointed this out to the gallery they were not pleased, to say the least. The same gallery lied about breakage...they just lied to my face. To tell the truth, I am just so fed up with galleries that I am selling my work myself from my studio. So far, I am doing better for myself than any gallery ever did for me and I no longer have to simply accept their treatment nor do I have to pay 50% commission. Of course, I do work harder, and I do not particularly like having people in my studio but..... I do realize that I am in a unique location so I am doing my best to make it work for me. Two major galleries in our city closed this past while. Another last winter. People who come to my studio often tell me that they will look to deal directly with the artist if at all possible. Now with a quick Google name search that is more possible than ever. Maybe the gallery/artist relationship is due for some really large changes.